The Miraculous Medal, also known as the Medal of the Immaculate Conception, was originally designed by Saint Catherine Labouré following her vision of the Blessed Virgin Mary in 1830 in Paris. Many believe that wearing the medal, while practicing faith and devotion, may bring them good graces through the intercession of Mary. 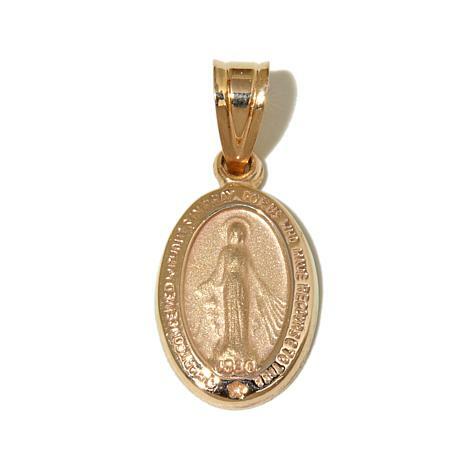 Yellow gold, oval pendant features raised image of the Virgin Mary and the words, "O Mary conceived without sin pray for us who have recourse to thee"
Pendant reverse has 12 stars surrounding a large "M," from which a cross arises. 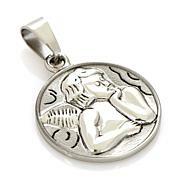 I purchased this piece because i was thrilled when i saw how petite it wasmost miraculous medals are much larger. despite its small size, it is extremely sturdy and solid! it has a nice large bale. 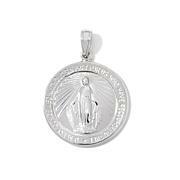 its obvious to anyone from even a distance what it is, if they know a miraculous medal. i actually wear it on a rope chain together with my crucifix and its a perfect addition. definitely worth the money! 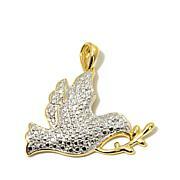 I really like this...it is small but perfect for me. Replaced a medallion I received at birth and wore everyday. I lost it about 3 years ago, this is nearly an exact match. So grateful to have found it. Very pretty medal. It is very small.